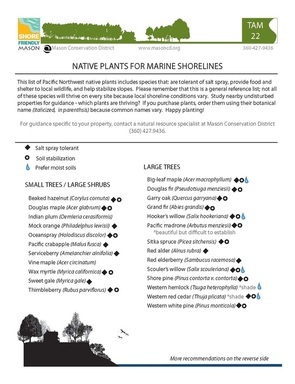 The pictures below represent many of the common native plant species found along marine shorelines in South Puget Sound. All of the plants below play an important role on the shoreline by stabilizing slopes and banks with their roots, by helping to manage rain water and shallow groundwater, and by providing food, shelter and cover for local wildlife. We are also extremely fortunate that so many of them are beautiful landscaping plants! Check for Mason Conservation District's Native Plant Sale December-February of each year. Custom plant orders available upon request. Contact Jen Thurman-Williams at jentw@masoncd.org or 360-427-9436 ext. 113. 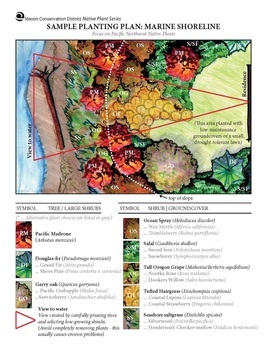 Also check out your local Master Gardener plant sales!